When the calendar indicates April or May, it is time to start combing the Mornington Peninsula for Pine mushrooms. Unsurprisingly, they grow under pine trees, often in association with Boletus (edible but why would you bother) and Amanita, the Noddy and Big Ears toadstools that you don’t go near, they are poisonous. You can pay anywhere between $20 and $40 a kilo at Victoria Market but it’s more fun to make a day of it and experience the thrill of the chase. There’re good coffee shops and cafes on the peninsula even if it’s been too cold/dry/picked over to fill a bag with these fine-looking orange-hued fungi. 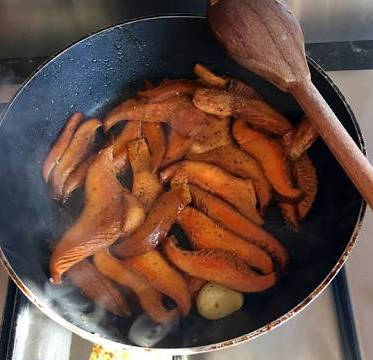 Lactarius deliciosus, commonly known as the Saffron milk cap is one of the best known members of the large milk-cap genus Lactarius in the order Russulales. It is found in Europe and North America and thankfully it has been accidentally introduced to other countries and can be found growing under road-side pine trees. A fresco in the Roman town of Herculaneum appears to depict Lactarius deliciosus and is one of the earliest pieces of art to illustrate a fungus. Lactarius deliciosus was known to Linnaeus who officially described it in Volume Two of his Species Plantarum in 1753, giving it the name Agaricus deliciosus, the specific epithet deriving from Latin deliciosus meaning “tasty”. It is commonly known as saffron milk-cap, red pine mushroom, or simply pine mushroom in English. Its Catalan name is rovelló or rovellons while its Castilian name varies (niscalo, mizcalo…). An alternate North American name is orange latex milky. 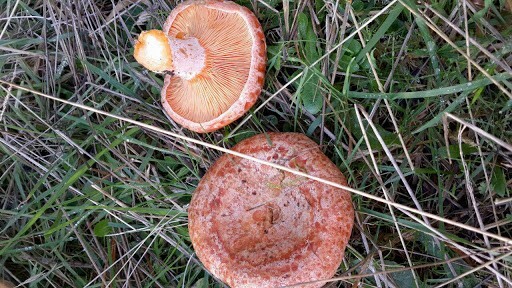 Both this and Lactarius deterrimus are known as Çam melkisi or Çintar in Turkey. In the Girona area, this type of mushroom is called a pinatell because it is collected near wild pine trees; they are typically harvested in October following the late August rain. Due to its scarcity it commands high prices. Lactarius deliciosus has a carrot orange cap which is convex to vase shaped, inrolled when young, 4 to 14 cm (1.5–7 in) across, often with darker orange lines in the form of concentric circles. The cap is sticky and viscid when wet, but is often dry. It has crowded decurrent gills and a squat orange stipe which is often hollow, 3 to 8 cm (1–3 in) long and 1 to 2 cm (0.4–0.8 in) thick. This mushroom stains a deep green color when handled. When fresh, the mushroom exudes an orange-red latex or “milk” that does not change color. Lactarius deliciosus grows under the acidic soil of conifers and forms a mycorrhizal relationship with its host tree. It is native to the southern Pyrenees where it grows under Mediterranean pines. Both this fungus and L. deterrimus are collected and sold in the İzmir Province of southwestern Turkey, and the Antalya Province of the south coast. It can also be found in woodlands in North America as well as having been introduced to Chile, Australia and New Zealand, where it grows in Pinus radiata plantations. A very popular place for collecting this mushroom, especially among the Polish community, is in the Oberon area in New South Wales, Australia, where they can grow to the size of a dinner plate. Many people of Italian, Polish, Ukrainian and other eastern European ancestry in the states of Victoria and New South Wales, Australia travel to collect these mushrooms after autumn rainfall around Easter time. In Cyprus it is found in the pine forests where many people “hunt” them with vigour. It is considered as one of the local delicacies. Sliced milk-caps, fried in olive oil, served on toasted sourdough. Lay your ears back and enjioy! Lactarius deliciosus is a widely collected mushroom in the Southern Pyrenees and Majorca and used in Spanish Cuisine. One recipe recommends they should be lightly washed, sliced longitudinally and fried in olive oil with a small amount of garlic and serve drenched in raw olive oil and parsley. The same recipe advised that butter should never be used when cooking this mushroom. I used an olive oil-based medium. Further north and east it is a feature of Provençal cuisine. They are also collected in Poland, where they are traditionally served fried in butter, with cream, or marinated. They are also very known in Cyprus, where they are usually cooked on charcoal and marinated with olive oil and lemon, or fried with onions with red wine. In some older guides, the saffron milk cap is considered an excellent mushroom, having ‘a crisp texture’.